1. Dress up in single colour You cannot get wrong with dark orange, grey or brown. Dress up in single colour outfit will make you stand out and look fashionable, you just have to match same colour with slightly different tone. 2. Suede material This is one of the key items for fall 2015, bohemian style is very hot this season. And Suede material is one of the key to bohemian look. Get a suede material skirt. You can match up simple tee with A line suede short skirt. 3. Wide leg trouser / palazzo pants If you haven't got yourself a culottes or wide leg pants, it's time to get one. Tuck in your shirt in your pants, and wearing a high heels to stand out with wide legs trouser. This is the trend right now, like what we saw at Celine or Loewe. 4. Bohemian cardigan What kind of outerwear you can buy now? Choose with a bohemian print or anything with fringe. Stand out from the crowd, choose material that is not too thick. You can spot these on Chloè or Burberry runway for fall 2015. 5. Khaki colour This colour come out at the end of spring and it will continue to be trendy in the fall season. It is spotted both Chloe and 3.1 philip runway show. You can get outerwear that is in green khaki colour matching with earthy colour top or dress. 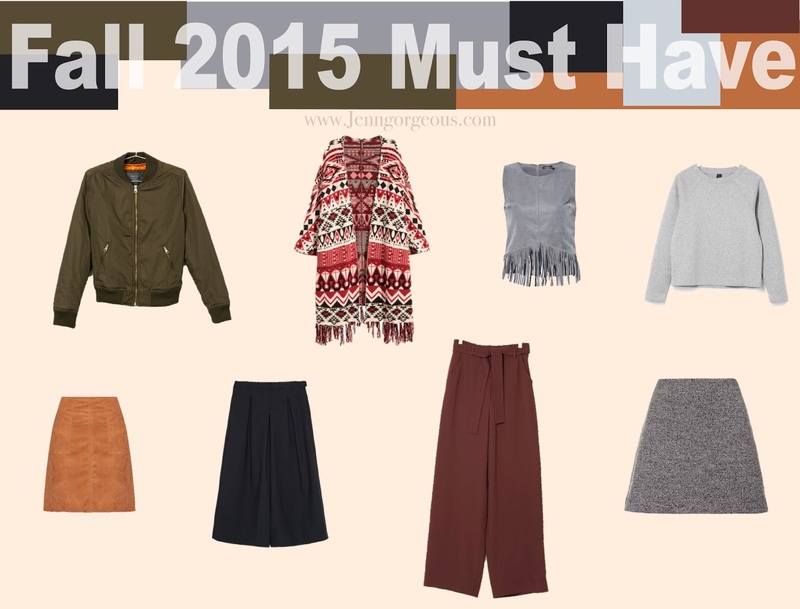 What your favourite 2015 fall season trend? Share with me in the comment box down below.